Welcome back to all our Cubs, Scouts, Venturers and Rovers, and your families. We trust you had a relaxing school holidays and are raring to get back into action for 2018. It will be a busy year as we prepare our Scouts for their Jamboree at the end of the year. We will be celebrating the start of a new Scouting year on Monday, February 5, with our now-traditional family picnic and ice-blocking at Jones Park (behind the Scout hall, on Albion Street). Usually this event is held to end our year, but the weather was so atrocious on the scheduled date in December that we shifted it to February. This event is for all our sections (Cubs, Scouts, Venturers and Rovers), and families are encouraged to bring a picnic or food to cook on the barbecue. Ice-blocking (pictured above) is a fun activity which involves freezing an ice-block large enough to sit on, and then riding it down a hill at a rapid speed. Helmets are required for safety reasons. Sam Smith and Jesse Mazis, two members of our rover crew (Kingsford Smith Rovers) went to Sydney to meet with Sir Charles Kingsford Smith’s son, Charles, who was in Sydney on a family holiday from the USA. This was a great experience for them. One of our scouts participated in “Bay Jam” a great camp held at Mt Martha. Four rovers participated in “Surf Moot” at Anglesea – an annual camp for rovers held over the Australia Day weekend. Also over the school holidays, Jamie (our Scout leader) and Ben (one of our assistant Cub scout leaders) both completed their basic training. 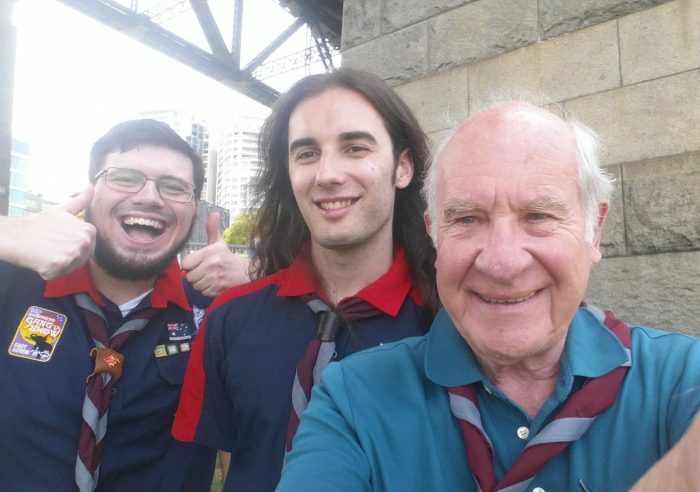 We have a new volunteer assistant Scout leader this year also: welcome to Su Rogerson. If anyone else would like to become a leader or an adult helper, please let Group Leader Sally Smith know on 0409 137 484 know.